The Invidia divorced wastegate style downpipe features a separator plate to separate exhaust flow between the turbine and the wastegate, designed to reduce exhaust turbulence that can occur in internal wastegate turbochargers. The divorced style downpipes are available with a high flow cat or completely catless. Each downpipe features 3" diameter stainless steel piping, 1/2" thick flanges, and a cast upper mouth section. Please note that without engine management such as the Cobb Accessport, a catless downpipe will trigger a check engine light. Invidia now offers a 2 bung version to make tuning easier! A plug is included so you don't have to run two sensors immediately. 3" exhaust gasket included, turbo to downpipe gasket sold separately. NOTE: Under Federal EPA regulation, replacement of original catalytic converters is allowed only if the original converter(s) is missing, or the vehicle has more than 50,000 miles or is at least five years old and the need for a replacement has been established and documented, or a local inspection program has determined the existing converter is in need of replacement. Please note that no aftermarket catalytic converters are legal for installation in California on OBD II vehicles (some 1994 & 1995, and all 1996 and later vehicles). There is a chance of seeing a CE Light: Inefficient cat code when running less than two cats, so if seen, contact us for the mechanical fix (sold separately). All performance parts have been designed and are intended for off highway application only. Installation of these parts on a vehicle intended for use on public roads may violate state or federal laws and regulations including those relating to emissions requirements and motor vehicle safety standards. The increased decibel levels when running the exhaust cutout in the open position may get you a ticket for a loud exhaust! What you do with it is up to you. All engine modification components, except those that are exempt, have been designed and are intended for off-highway application. These components are for racing vehicles only, which may never be used on public roads and highways. Federal and many state laws prohibit the removal, modification, or rendering inoperable of any device or element of design affecting vehicle emission or safety in a vehicle used on public highways. Violation of such laws may subject the owner or user to a fine or penalty. Installation of this part may void the warranty coverage, if any, on your vehicle. Vehicles modified by the use of performance parts may no longer be lawfully used on public highways. User assumes all cost and risks associated with these items. The Injen Downpipe is a full 3" catted downpipe made from 304 stainless steel. The bellmouth design allows for maximum flow for your Subaru with many mods and / or an aftermarket turbo. The built in high flow catalytic converter keeps it legal while still being efficient. Injen has incorporated a built in CEL fix which reduces the chances of throwing a code for your aftermarket downpipe. A second O2 bung on the top of the downpipe allows for easy installation of a wideband sensor. No gaskets are included but new hardware is provided. What performance enthusiast is not looking for the best flowing exhaust on the market? Tanabe's Medalion Concept G exhaust systems feature aggressive styling and a deep sporty sound, but are designed to keep volume under the legal standard 93db range. The secret is in the innovative Advantex muffler packing which keeps the volume low and the flow high while maximizing muffler longevity. This system utilizes SUS304 mandrel bent piping and is routed in the most direct path possible to produce exceptional flow velocity. All engine modification components, except those that are exempt, have been designed and are intended for off-highway application. These components are for racing vehicles only, which may never be used on public roads and highways. Installation of this part may void the warranty coverage, if any, on your vehicle. Vehicles modified by the use of performance parts may no longer be lawfully used on public highways. User assumes all cost and risks associated with these items. The HKS Hi-Power WRX & STI Catback Exhaust features 3" coated mild steel piping and a stainless steel angled-exit Hi-Power muffler for true JDM look and sound. 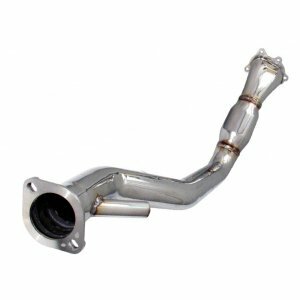 The full straight, 3" piping and free-flowing muffler with 4.75" tip reduce back pressure and create significant performance gains while giving your WRX or STI a deep, throaty exhaust tone. The TXS Catback features full stainless steel construction, 3" diameter piping, and a 3.5" polished tip. The tone is not too loud for those who are looking for a mildly aggressive tone for their daily. 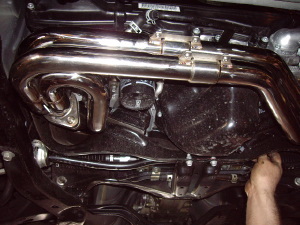 This is a two piece catback that mates up to a stock or aftermarket downpipe. Full 3", mild tone, great price.This is the perfect choice for your daily driver. 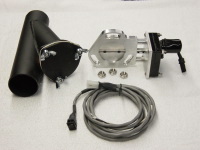 Electric Exhaust Cutout Kit includes 'Y' pipe, electric valve and switch. This kit is designed to better your cars performance and feel. The cutout works by welding into your stock or modified exhaust. They can be placed anywhere after the headers. To open the cutout you press a switch, which opens cutout, releasing your exhaust. This enables you to bypass your muffler, increasing horsepower and giving your car an extremely throaty rumble. Small black rocker switch is only .75" X .50"
Invidia's G200 catback exhaust for the WRX & STI feature 3" stainless steel piping, a resonated midpipe for improved noise reduction, and a flex section for optimal fitment. The G200's 5" titanium tip gives it a unique look and the large muffler is good at reducing noise,making this a great all-around performance exhaust. 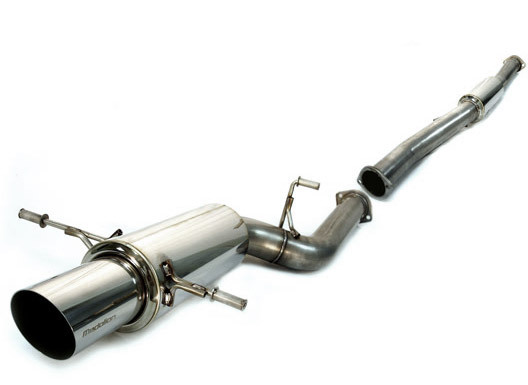 The Invidia Q300 catback exhaust system for the 02-07 WRX & STI sounds as good as it looks. 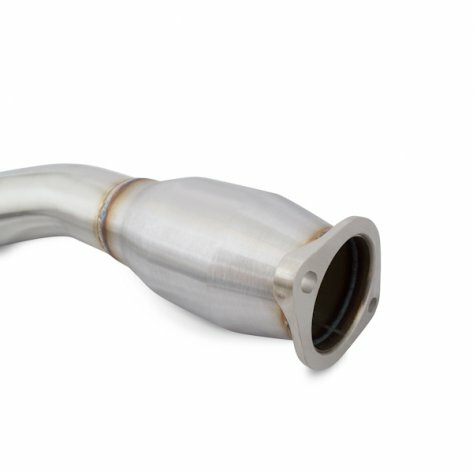 The Q300 features mandrel bent 76mm stainless steel piping and a free flowing oval style sport muffler to provide better exhaust flow for improved performance. Bolting up a Q300 to your EJ25 will allow your Subie's sonorous exhaust note to come through loud and clear when you want it to, without producing harsh or overly loud overtones; the perfect choice for those who want great performance with an exhaust note that won't wake the dead. The Q300 exhaust is designed with a polished rolled stainless 101mm tip for a stealthy sleeper appearance. When you drive your car, you don’t want to just feel the power, you want to hear it! The MagnaFlow catback exhaust system for the 05-09 Subaru Legacy GT utilizes cutting edge technology from one of the industry leaders in performance exhaust systems. All exhaust systems are computer designed and dyno tested to deliver guaranteed performance and offer a smooth deep note. 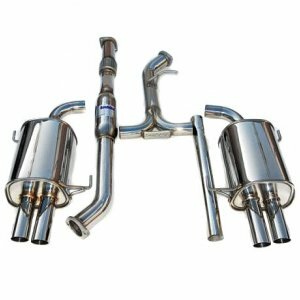 These products are quality built from 100% stainless steel and feature show caliber mirror polished mufflers and exhaust tips. All MagnaFlow products include their Lifetime Warranty, so you are guaranteed to enjoy your exhaust system for years to come. 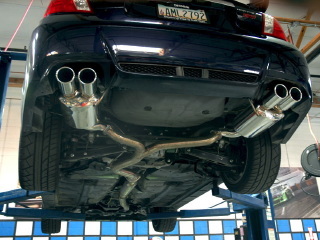 The Invidia Q300 catback exhaust system for the 05-09 Subaru Legacy GT sounds as good as it looks. A full true dual exhaust system, the Q300 features mandrel bent stainless steel piping and free flowing oval style sport mufflers to provide better exhaust flow for improved performance. Bolting up a Q300 to your EJ will allow your Legacy's sonorous exhaust note to come through loud and clear when you want it to, without producing harsh or overly loud overtones; the perfect choice for those who want great performance with an exhaust note that won't wake the dead. Comes with all necessary hardware, gaskets, and instructions needed for installation. 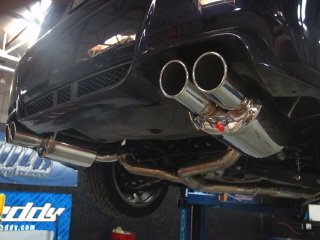 The Invidia G200 catback exhaust system for the 04-08 Subaru Forester XT sounds as good as it looks. A full true dual exhaust system, the G200 features mandrel bent stainless steel piping and a free flowing sport muffler to provide better exhaust flow for improved performance. Bolting up a G200 to your EJ will allow your Forester XT's sonorous exhaust note to come through loud and clear when you want it to, without producing harsh or overly loud overtones; the perfect choice for those who want great performance with an exhaust note that won't wake the dead. Comes with all necessary hardware, gaskets, and instructions needed for installation. 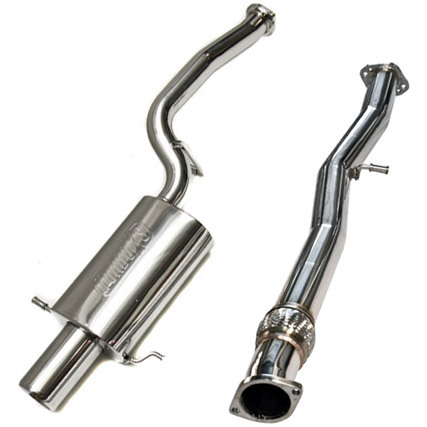 AP has developed one of the best sounding and performing exhaust systems for the 2008 and up Subaru WRX Sedan. The new exhaust features an all T304 stainless steel piping in 2.5inch diameter from the catback. The piping is all hand polished featuring robotic TIG welding. The midpipe includes a resonator to assist in keeping that traditional boxxer engine sound with an exotic race tone touch that does not drone in the cabin. 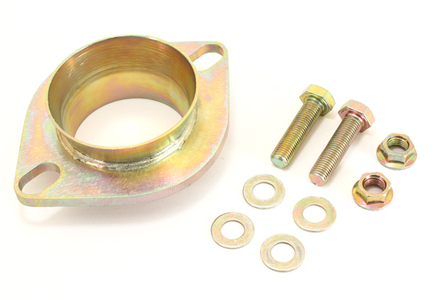 The ½ inch thick flanges offer a secure fit along with the factory placement exhaust hangers. 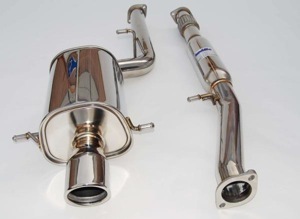 The catback exhaust uses a high flow Y-Pipe to efficiently direct exhaust to the dual exhaust canisters. The Y-pipe features a merged collector and 2.5 inch piping on each extension to give your exhaust a combined 5 inches of exhaust flow. The straight through mufflers are designed to optimize horsepower with very little restriction. The mufflers do feature removable exhaust silencers for those wanting the ability to keep the system very quiet during daily use. 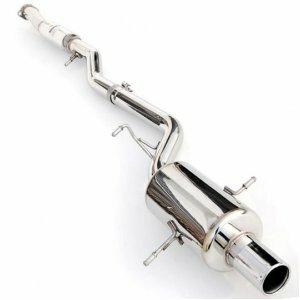 The catback exhaust features dual 4 inch single straight exit Stainless Steel with the AP logo. As tested on a Mustang all wheel drive dyno, the AP catback exhaust made an impressive 17 all wheel horsepower and 28ft/lbs of torque. 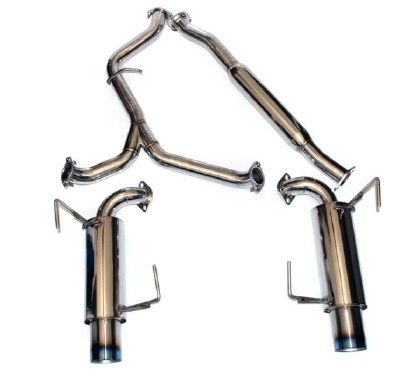 The exhausts are available for all 2008 and up Subaru WRX Sedans. 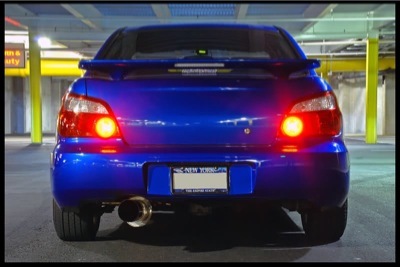 AP has developed one of the best sounding and performing exhaust systems for the 2008 and up Subaru WRX Sedan. 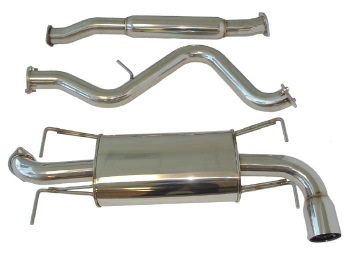 The new exhaust features an all T304 stainless steel piping in 3inch diameter from the catback. The piping is all hand polished featuring robotic TIG welding. The midpipe includes a resonator to assist in keeping that traditional boxxer engine sound with an exotic race tone touch that does not drone in the cabin. The ½ inch thick flanges offer a secure fit along with the factory placement exhaust hangers. The catback exhaust uses a high flow Y-Pipe to efficiently direct exhaust to the dual exhaust canisters. The Y-pipe features a merged collector and 2.5 inch piping on each extension to give your exhaust a combined 5 inches of exhaust flow. The straight through mufflers are designed to optimize horsepower with very little restriction. The mufflers do feature removable exhaust silencers for those wanting the ability to keep the system very quiet during daily use. 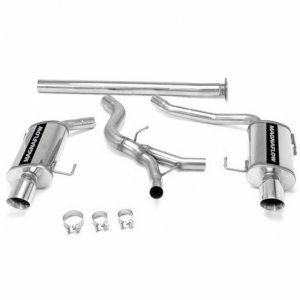 The catback exhaust features dual 4 inch single straight exit Titanium Tips with the AP logo. As tested on a Mustang all wheel drive dyno, the AP catback exhaust made an impressive 17 all wheel horsepower and 28 ft/lbs of torque. 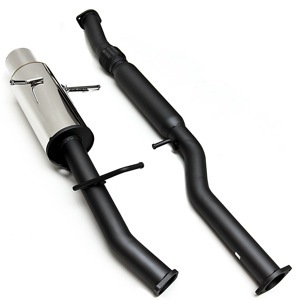 The exhausts are available for all 2008 and up Subaru WRX Sedans. The Invidia catback exhaust system sounds as good as it looks. It features mandrel bent stainless steel piping and a free flowing oval style sport muffler to provide better exhaust flow for improved performance. Bolting it up to your EJ25 will allow your sonorous exhaust note to come through loud and clear when you want it to, without producing harsh or overly loud overtones; the perfect choice for those who want great performance with an exhaust note that won't wake the dead. 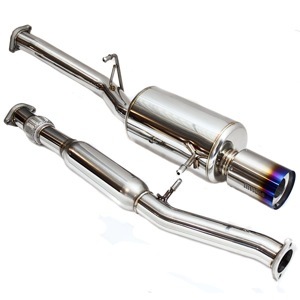 AP has developed one of the best sounding and performing exhaust systems for the 2008 and up Subaru WRX STI. 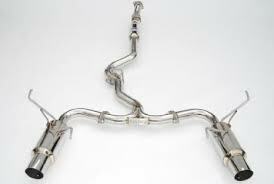 The new exhaust features all T304 stainless steel piping in 3inch diameter from the catalytic converter back. The piping is all hand polished featuring robotic TIG welding. The midpipe includes a resonator to assist in keeping that traditional boxxer engine sound with an exotic race tone touch that does not drone in the cabin. The 1/2 inch thick flanges offer a secure fit along with the factory placement exhaust hangers. The muffler is designed to optimize horsepower with very little restriction. The catback exhaust features a quad exit Titanium Tip with the Agency Power logo. As tested on a Mustang all wheel drive dyno, the AP catback exhaust made an impressive 20 all wheel horsepower and 20ft/lbs of torque. 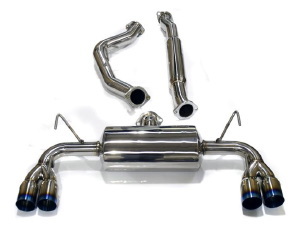 The exhausts are available for all 2008 and up Subaru WRX STI Wagons. MR OE-RS series cat backs are based on factory style, with bigger piping, OEM style polished mufflers and quiet sound. The cat back system is made stainless steel. All piping are mandrel bent with a high polished finish. Exhaust system comes with all the necessary hardware needed for a direct bolt on installation. Improves HP with minimal noise. 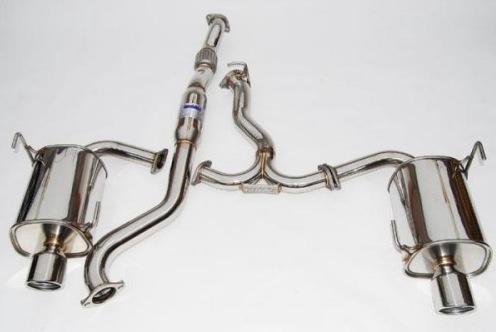 AP has developed one of the best sounding and performing exhaust systems for the 2011 STi Sedan. 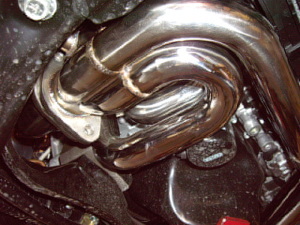 The new exhaust features an all T304 stainless steel piping in 3inch diameter from the catback. The piping is all hand polished featuring robotic TIG welding. The midpipe includes a resonator to assist in keeping that traditional boxxer engine sound with an exotic race tone touch that does not drone in the cabin. The ½ inch thick flanges offer a secure fit along with the factory placement exhaust hangers. The catback exhaust uses a high flow Y-Pipe to efficiently direct exhaust to the dual exhaust canisters. The Y-pipe features a merged collector and 3 inch piping on each extension to give your exhaust a combined 5 inches of exhaust flow. The straight through mufflers are designed to optimize horsepower with very little restriction. The catback exhaust features dual 3.5 inch quad tips with the AP logo. As tested on a Mustang all wheel drive dyno, the AP catback exhaust made an impressive 17 all wheel horsepower and 28ft/lbs of torque. 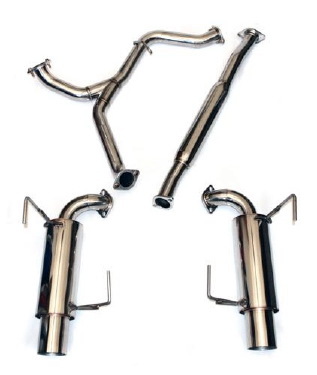 The exhausts are available for 2011 STi Sedans. The N1 has a full 76mm (3 inch) mandrel bent stainless steel piping optimizes flow and minimizes turbulence with a unique exhaust path that deletes all unnecessary bends, unleashing horsepower that would normally be restricted. So with the 'Race' N1, you will be getting an exhaust system that was designed to provide your 2.5L with more power. The Invidia N1 style system differs in their midpipe. The ravenous N1 'Race' exhaust features 76mm (3 inch) mandrel bent stainless steel piping. The result is a much louder, race car exhaust tone that will scream at wide open throttle. 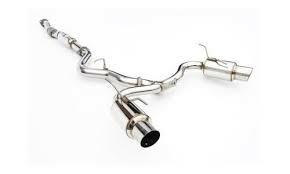 All N1 exhaust systems for the 2015 STI include necessary hardware and gaskets for installation. Mishimoto is proud to release the performance Subaru WRX downpipe for the 2015+ models. 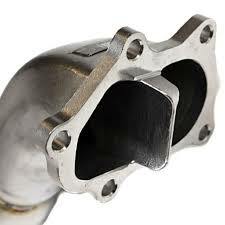 The biggest restriction in the stock exhaust system is the downpipe. By installing the WRX downpipe, the FA20DIT exhaust system is able to breathe easier, providing a significant increase in horsepower and torque when tuned. During countless dyno pulls, The car sees gains of up to 73 whp and 64 wtq with the catted downpipe, The 2015 WRX downpipe provided an extremely aggressive turbo and exhaust tone under acceleration and boost, giving you that aggressive tone you have been looking for! 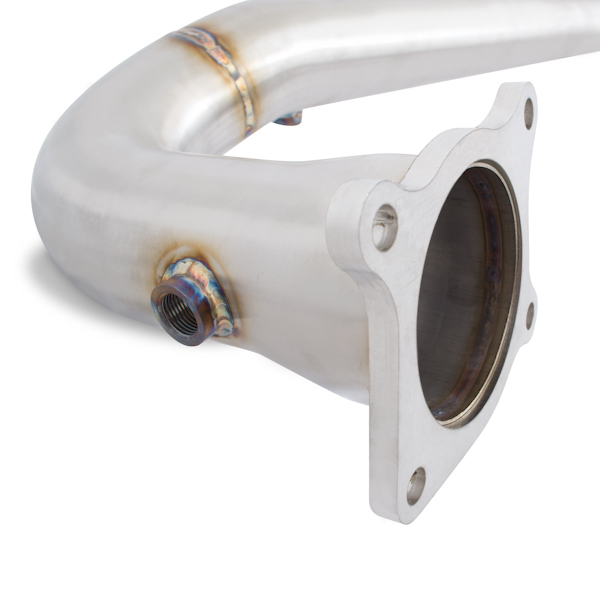 The engineers designed the WRX downpipe as a one-piece design with precision TIG-welded 304 stainless steel. This allows uninterrupted exhaust flow from the 3.5" 4-bolt exhaust flange all the way through the 3.0" downpipe. The engineers also created two different transmission-specific brackets, for the 6-speed manual and CVT, to mount the downpipe to the transmission. Because the engineers know that WRX owners commonly like to add wideband O2 gauges, they included an additional O2 sensor bung and plug in an ideal location for aftermarket wideband sensors! To top it off, the 2015 WRX downpipe includes new turbine housing studs and nuts (which commonly strip), a new turbo outlet gasket, a new 3” 2-bolt flange gasket, and all stainless steel hardware, so you don’t have to worry about rust on your hardware. This downpipe adapter for the 2011-2014 STI is the perfect solution to the problem of matching a 3" aftermarket downpipe to a catback system that uses the stock 2.5" taper. The 3" downpipe adapter plate allows you to install the factory donut gasket on the end of any 3" flat flange downpipe to ensure a perfect seal with the factory or any other 2.5" tapered catback exhaust system (Cobb Tuning, Blitz, Borla & Greddy just to name a few). 4 into 1 stainless steel header and uppipe. No bending or modification of frame are necessary. 25 WHP gain and 30 WTorque, were you need it in low and mid range rpms. Includes a detachable uppipe. Full stainless steel. 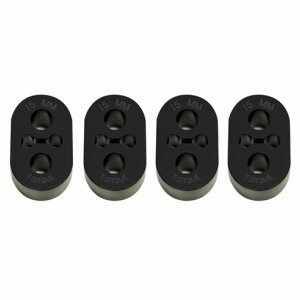 Torque Solution offers upgraded polyurethane mounts for your WRX or STI to reduce exhaust movement and vibrations. OEM rubber mounts sag over time and let your exhaust sway about which can possibly cause cracking and gasket leaks. Torque Solution uses the highest quality 75A durometer polyurethane to ensure your exhaust stays put. Made in the USA and track torture tested. 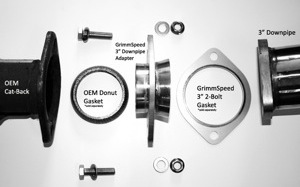 These complete kits contain enough mounts to do your entire exhaust. All engine modification components, except those that are exempt, have been designed and are intended for off-highway application. These components are for racing vehicles only, which may never be used on public roads and highways. Federal and many state laws prohibit the removal, modification, or rendering inoperable of any device or element of design affecting vehicle emission or safety in a vehicle used on public highways. Violation of such laws may subject the owner or user to a fine or penalty. Installation of this part may void the warranty coverage, if any, on your vehicle. Vehicles modified by the use of performance parts may no longer be lawfully used on public highways. User assumes all cost and risks associated with these items.